Can you still remember how many backpacks do you own in your entire life? 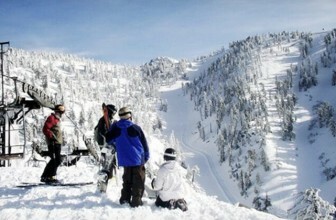 How about the last time you bought a backpack for work or for outdoor activities? For some people, a backpack may not the best solution for carrying their belongings may it be for work, traveling, or outdoor activities. But for like minded people like us, a backpack is life! Just think about those days when you are still in school, some might think that backpacks are only for students but that is not true at all. 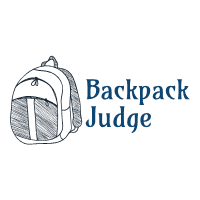 Backpacks are for everyone and it can suit well in different works, activities, and lifestyles more than you know. If you just know what kind of backpack to get then you are good to go. Whether you are a professional or a do-it-yourself handyman, you can benefit a lot from using a special backpack that can help you carry everything you need for your work. If there is a special backpack that suits best for you, it is non-other than a tool backpack setup. When your two hands are not enough to carry and transport enough tools to do your work, all you need is just one tool backpack to solve your problems. Forget the bulky toolbox that strains your arms, shoulders, and back. Let a single backpack carry the essential tools for you anywhere you need them and distribute the tools’ weight equally on your shoulders. A tool backpack is the easiest way to transport all your tools anytime. Therefore, you don’t have to worry all the time if you left one or two pieces of your tools once you are in front of your work. A tool backpack is designed to help you have an easy access to your tools as fast as possible. It is also built with better and stronger materials in order to protect every single tool you carry inside the bag. You can even have your very own with waterproof fabric that provides an additional layer of protection for your tools. A tool backpack is specially designed for heavy-duty work that normally features sturdy shoulder straps and extra handles with paddings for comfort. 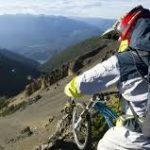 Though tool backpacks are popularly known for its heavy-duty construction, it’s still important that you know which to pick when choosing a tool backpack to carry your tools perfectly. It is not always enough that the backpack has ample of space for your tools, sometimes the quality differs too depending on its carrying capacity. This is the most common type of tool backpack that can be bought in the market which is perfect for carrying long but lighter tools and personal items. 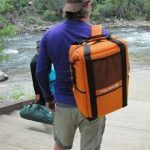 If you love going out of town and going on a night out to camp, then a regular tool backpack is enough to carry your personal items and survival essentials with an easy access. 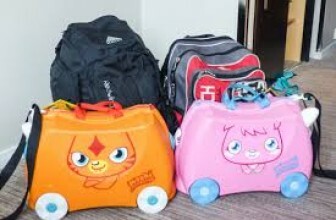 This is also great if you opt to transport just a few tools only and don’t want a too bulky backpack. As its name suggests, this type of tool backpack is perfect for hauling all your tools in one bag and withstanding years of usage. Since this type of backpack is designed to hold more and heavier tools, its tough construction can be easily seen from its design and materials. Thus, you can worry less about wears and tears each time you bring your bag and leave it lying on the floor or in construction sites while you’re working. Who Needs to Use a Tool Backpack? Since a backpack allows us to carry our things hands-free, it technically gives us the freedom to move better and do more things. 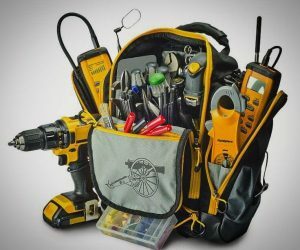 This makes sense why a tool backpack is a popular kind of bag among professionals and DIY enthusiasts who tend to use more tools than regular households. So, aside from DIY enthusiasts and busy students who are on the way to finish a school project, who else would need and carry different kinds of tools on their back? 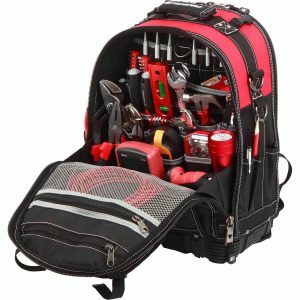 Aside from the mentioned above, people like mountain climbers, carpenters, electricians, masons, mechanics, contractors, decorators, technicians, whitesmiths, and plumbers could make use of a tool backpack all the time. Depending on the line of work you are in, you can find a perfect tool backpack that includes special features that suits you the most. 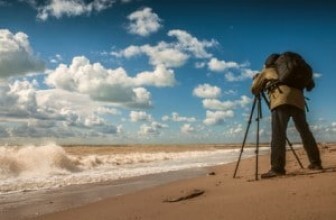 You can even take advantage of extra features that could help you carry your gadgets along whatever type of profession you practice which is mentioned above. Most electricians don’t need too heavy and bulky tools so a small tool backpack would do to carry a duct tape, screwdrivers, pincers, drill, charger, and more hand tools. You could also keep other necessary tools for preventive maintenance and installations in case of emergency. You could do more pockets as a plumber to insert small and large tools especially if you would be working in manholes. In addition, be sure to keep a reliable flashlight, hacksaw, metal file, tongue and groove pliers, basin wrench, pipe wrench, hand auger, adjustable wrench, tubing cutter, plunger, a fireproof cloth, and a closet auger in your bag. Carpenters’ tool backpacks normally have a bigger compartment to hold larger tools and stronger zippers to hold the tools’ weight. Nonetheless, don’t forget to pack your hammers, tape measure, squares, bubble levels, utility knife, marking tools, screwdrivers, circular saw, and a power drill. Masons’ tool backpacks are typically wider and taller to hold a trowel, hammer, chisel, power saw, level, and sometimes even a helmet and protective gears. Thus, a backpack with multiple exterior pockets would be really handy to hold larger tools. Generally, a tool backpack is pretty handy for different types of handymen to carry a lot of stuff while keeping its weight balanced on the back. Whatever type of tool backpack you are looking for, reading this guide can help you learn more about a tool backpack and some of the basic things to pack for your work. But most importantly, your tool backpack should have enough space and carrying capacity to hold all your necessary tools for a long time.